We know we’re not the only ones who love geriatric dogs! We want to hear about you and the old dogs you love and have loved. Email your story to suzanne@retiredretrievers.org to have it posted here. Be sure to add a picture (or two). We love to see those sweet old faces! Our golden retrievers, Piper and Flyer, weren’t old when we adopted them, but they lived long lives, 14 and 15 respectively, so we have experienced the love of a geriatric dog firsthand. We adopted them both from Guide Dogs for the Blind when they were each about 1 1/2, and about a year apart. Neither of them qualified as a guide dog for differing reasons, so they became available for adoption. Piper and Suzanne were buddies from the start, whenever they got the chance to be together at family gatherings. Yes, we are lucky enough to be related to Suzanne as cousins. Suzanne also made room in her heart for Flyer when we adopted her, and Flyer reciprocated. Piper always thought he was Suzanne’s favorite, though, and no one contradicted that. Both Piper and Flyer led active lives, joining Dennis in regular runs, playing in the snow, hiking and swimming with us and, in general, just becoming our faithful companions. 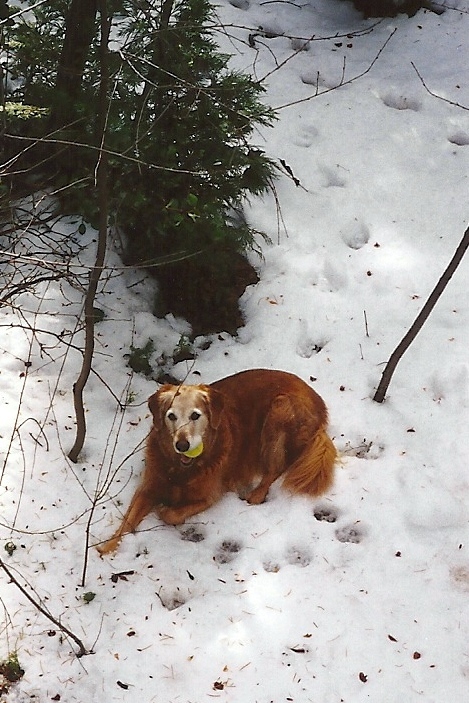 Piper never thought he was a dog; he was just one of the family. Flyer was a sweetheart. If they were alive today, they both would love what Suzanne is doing to rescue senior dogs. Just like we do!